The Monta aesthetic, at this point, is pretty well defined. They make rugged but refined tool watches that are vintage inspired, with splashes of bold color in the accents. The finishing is notably precise on their cases, with visible bevels on the lugs, and the sword hands have become something of a trademark. In terms of size, they have eschewed the mega-case look that some brand still cling to, keeping their lineup squarely in the 40-millimeter-and-under neighborhood. 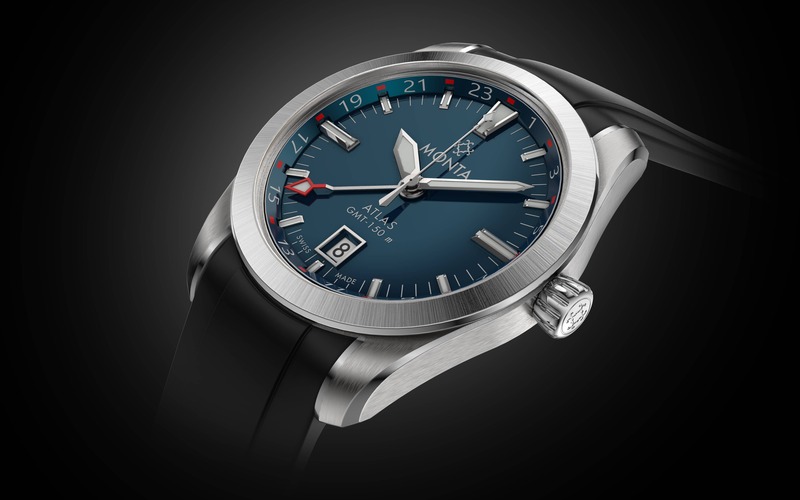 Their newest offering, the 38.5-millimeter Atlas GMT, doesn’t stray far at all from the Monta formula, but still manages to make a strong impression. The Atlas doesn’t break new ground, so much as it reaffirms what Monta does so well in the first place. This is, on paper, a conservative and inconspicuous GMT watch, a complication that Monta has already tackled with their Skyquest line. The Atlas comes in about two-and-a-half millimeters smaller than the Skyquest and is spec’d closer to the Triumph, and does away with the 24-hour bezel. In theory, it’s nice and discreet, and a little unassuming, but look at the dials. Each includes attention grabbing color choices with high contrast accents, with a lacquer treatment. The blue dial in particular is hard to get off of the mind. It’s almost turquoise, and well matched to the red markings at every other hour on the 24 hour scale.